Astronaut John W. Young has a service record that starts with test pilot flights, is followed by Apollo Moon Missions X and XVI, continues with piloting two Space Shuttle ventures, and culminates with being part of the support and planning teams for International Space Station missions into the 21st century. Lunar Journeys honors Young’s long participation in the Space Age as initiated in 1961 by President Kennedy when he spoke of putting a man on the moon before the end of the decade. This was a time when rocket flights to the moon morphed from science fiction to science fact; where NASA astronaut journeys and fictional space adventures merged into real-life experiences. 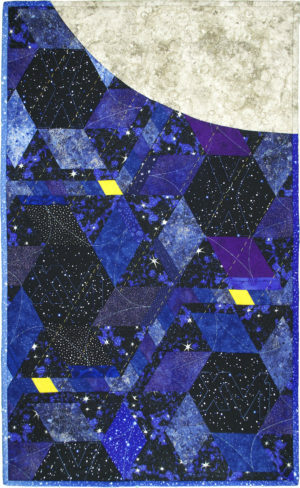 The quilt represents a vision of an endless horizon filled with stars, the surface of the Moon up close and personal, and space at the speed of light. The quilt’s goal is to represent, in the mathematical precision of hexagons meeting rhomboid shapes joined by triangles, and fabric expressing the dark but strangely changeable atmosphere, a perspective beyond the earthbound horizon. While the geometric shapes imply depth and precision, the quilting suggests the speed of space travel. Iridescent thread hand stitched over machine quilting hints at the subtle flickering of astronomical light. Diagonal lines of hand stitches were rendered in a solid color yellow thread twisted with an iridescent thread to make one workable strand. This is a vision that combines the adventurous optimism of a new frontier with the vastness of space. The quilting top consists of precisely cut and machine sewn geometric shapes. Machine and hand quilting include some words honoring Astronaut Young on the moon. 100% commercial cotton fabrics were used throughout, including cotton batting. Construction and quilting threads include solid color and variegated cotton, polyester, rayon, and Mylar.